We've been waiting for Roku to release its miniaturized dongle since CES, and now we finally know the flash drive-sized Streaming Stick will be available next month for $99. Priced the same as as the Roku 2 XS set-top box, it brings the same feature set but in a smaller package designed to work directly with your HDTV, thanks to power, remote control and data signals fed through an MHL-compatible HDMI port. While it will work with other MHL-ready host devices, manufacturers with Roku Ready stamped and certified HDTVs on shelves this fall will include Apex, Insignia and Hitachi -- Onkyo plans to ship receivers early next year. If you pick up an otherwise dumb flat-panel with the stick bundled along with it the price is set by that manufacturer, but the standalone plan means buyers savings are focused on the two cables they won't be needing, and simplified remote capability since their TV remote can talk to the Stick directly. Like the Roku 2 XS, the Streaming Stick also includes the motion control capable game remote. A separate move will benefit many existing Roku owners, as it is also announcing that Walmart-owned Vudu is launching on the platform today. You will need a Roku HD (2500), LT or Roku 2 box (or the Streaming Stick, once it launches) to take advantage of the Vudu app and its streams that bring quality of up to 1080p and 7.1 surround sound. 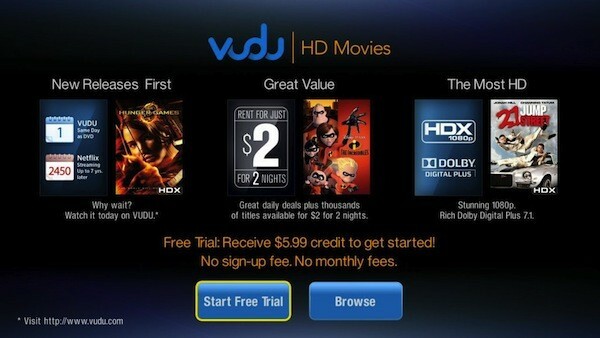 That also means access to Vudu-compatible UltraViolet movie titles on yet another set-top box, if that's a consideration, and users score a $5.99 credit with Vudu just for linking the account to their boxes. All the details are in the press release after the break, and on the Roku blog. SARATOGA, Calif. – Sept. 20, 2012 – People looking to stream video and music as well as play casual games on the television can soon choose from a range of devices that feature the popular Roku® streaming platform. Roku today announced that the Roku Streaming Stick™– a tiny wireless streaming player the size of a USB flash drive – will be available in October for $99.99. Customers plug the Roku Streaming Stick into Roku Ready® devices to instantly access the Roku platform which features more than 600 channels. "The Roku Streaming Stick extends our platform beyond the set- top box and into a range of consumer electronics devices. Manufacturers can now deliver a complete streaming experience without painstakingly building it themselves," said Chas Smith, senior vice president and general manager, Roku platform OEM business at Roku. "And because the Roku Streaming Stick will only get better over time – with more channels, new features and frequent software updates – customers can be confident that they will always enjoy the best possible streaming experience." SANTA CLARA, Calif. and SARATOGA, Calif., – Sept. 20, 2012 – VUDU and Roku® today announced the launch of the VUDU streaming channel on the Roku platform. VUDU is Walmart's subscription-free, video streaming service which offers more than 100,000 new releases, Hollywood classics, independent films and TV shows, and was recently ranked as the top streaming video service by Consumer Reports *. Available now on all Roku 2, Roku HD (model 2500) and Roku LT streaming players in the U.S. and coming to the Roku Streaming Stick in October, VUDU offers the world's largest selection of HD movies and delivers a cinema-like experience with vibrant-streaming 1080p HD and rich Dolby Digital Plus 5.1 and 7.1 surround sound. Movies on VUDU are available the same day they are released to DVD or Blu-ray, and can be purchased or rented without a subscription.